A segment is always smaller tan half of the circle. 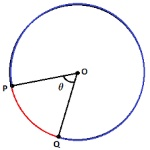 A "pie-slice" part of a circle - the area between two radiuses and the connecting arc of a circle. a straight line passing from side to side through the center of a body or figure, especially a circle or sphere. 2.a unit of linear measurement of magnifying power. In classical geometry, a radius of a circle or sphere is any of the line segments from its center to its perimeter, and in more modern usage, it is the length of any of them. A line which touches a circle at just one point. a fundamental relation in Euclidean geometry among the three sides of a right triangle. It states that the square of the hypotenuse (the side opposite the right angle) is equal to the sum of the squares of the other two sides. A line that links two points on a circle or curve. In general, an arc is any smooth curve joining two points. The length of an arc is known as its arc length. In a graph, a graph arc is an ordered pair of adjacent vertices. 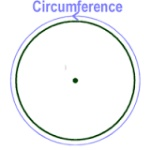 In particular, an arc is any portion (other than the entire curve) of the circumference of a circle.